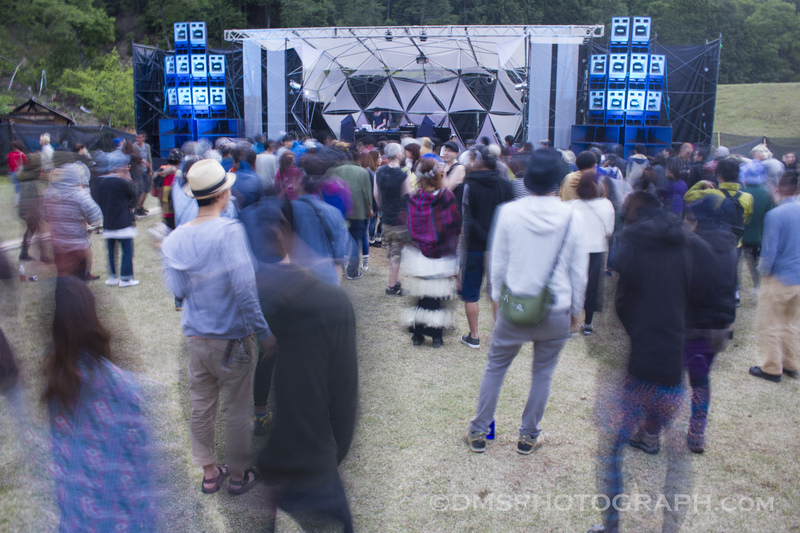 DMS Photograph | Dreams. Memories. Stories. DMS Photograph Dreams. Memories. Stories. Tsuyu – Japanese for rainy season. 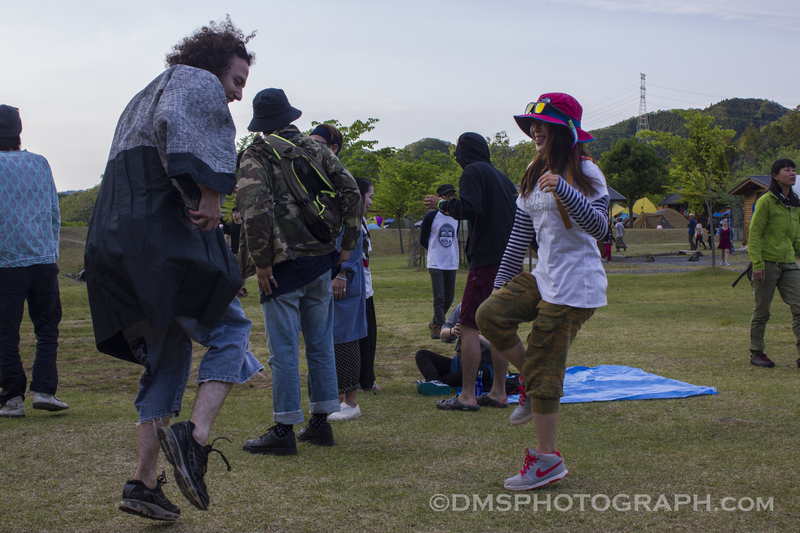 No late night dancing, no loud music – Japanese for normal. May – The month before Tsuyu. An early morning, bullet train, local train and ferry—these are the ingredients of Rabbit Island haikyo. Rabbit Island, officially known as Okunoshima, is a small island about 50km from Hiroshima in the Seto Inland Sea. 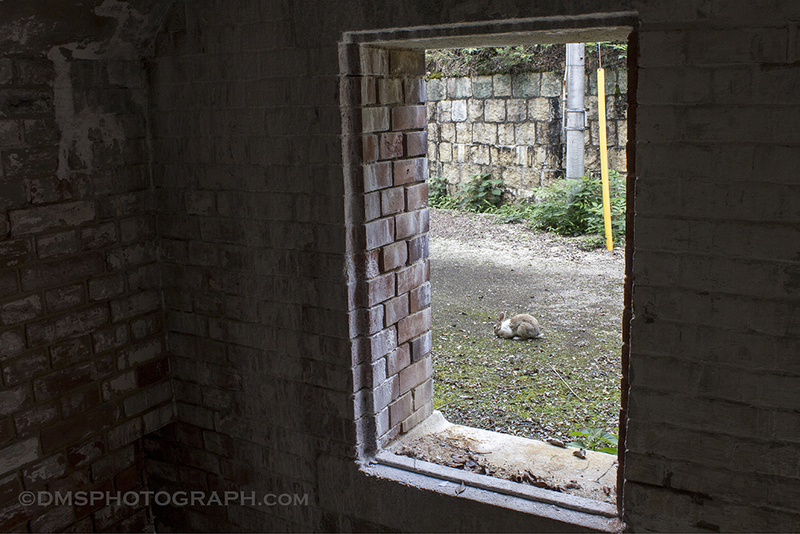 It’s a warm and fuzzy place, covered in hundreds maybe even thousands of rabbits. Nearly all natural predators were killed off in the late 1920s. Why, you may ask? Well to build a top secret government run poison gas manufacturing compound of course! 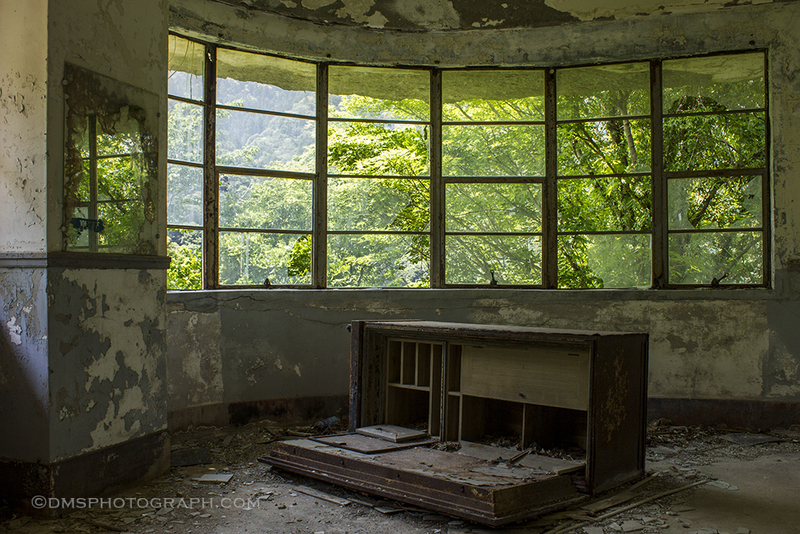 Mustard gas, lewisite and other poison gases were manufactured and stored on Okunoshima between 1929 and 1944. Although Japan signed the 1925 Geneva Protocol prohibiting the use of biological and chemical weapons, it didn’t necessarily ban the development of such weapons. Sadly, Japan still did use chemical weapons, many of which probably came from Okunoshima, to kill an estimated 80,000 Chinese soldiers. Of course this was, and in some ways still is, hush-hush. 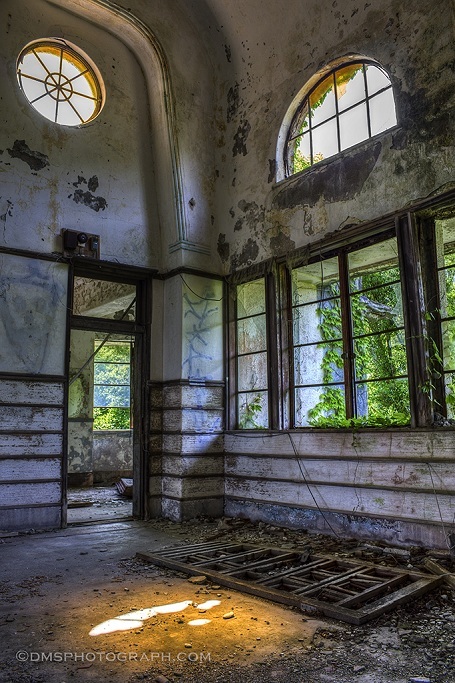 The very existence of Okunoshima was wiped from maps, history books and ultimately forgotten until 1988, when a museum opened on the island. Long story short, the history of Okunoshima is much more sinister than its current incarnation as the loveable and cute Rabbit Island. 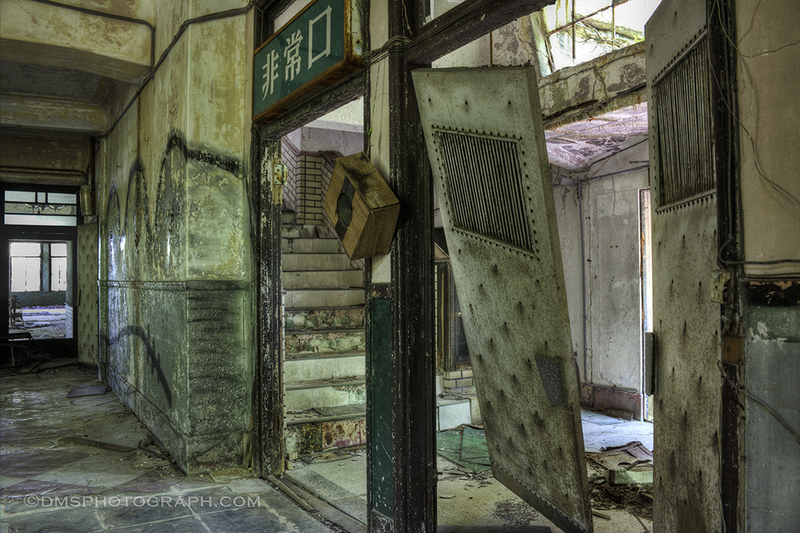 If you’re interested in reading more about the actual history of Okunoshima, Florian at Abandoned Kansai has a great article with more of the gritty details here. 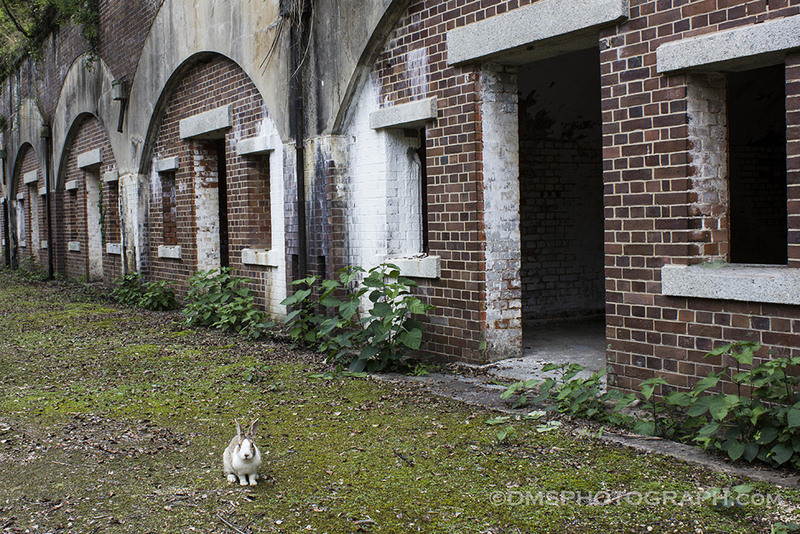 Naturally, I came for the ruins of an incredulous past rather than for fluffy bunnies. I like rabbits well enough, but wouldn’t travel many hours across Japan to pet them for a weekend. Surely, there is nothing wrong with those who do though. 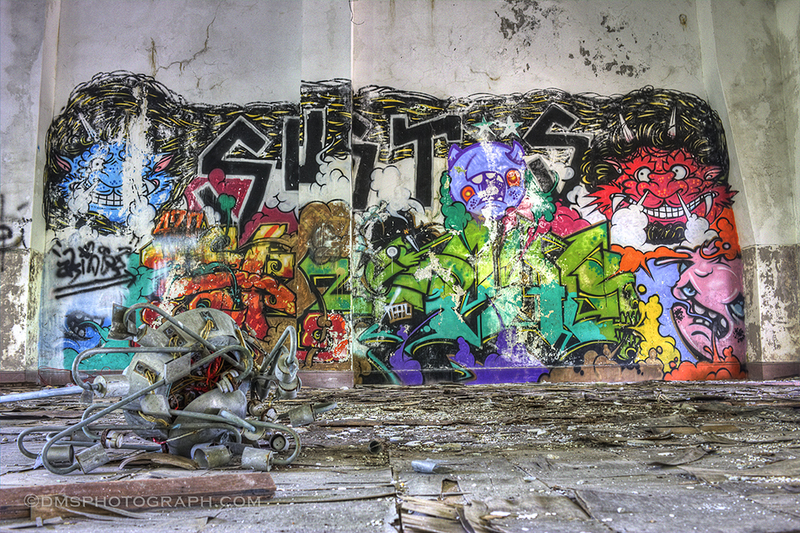 I’m more concerned about myself who is drawn to rotting concrete, rusted metal and less than wholesome fun. I had two days on the island with three of my friends. If you spend the night on the island you have two options—stay at the hotel or camp. We chose the latter, a fenced off patch of grass. The fence is theoretically used to keep the rabbits out, I say theoretically because it doesn’t. Rabbits are everywhere and will get into your fried rice mix if you don’t take drastic measures such as hanging your food in a bag from a tree. After renting some awesome electric-assist bicycles, a friend and I decided to circle the island and check out a few of the ruins dotting the island. Most of the ruins are fenced off and easily accessible to other tourists making it difficult to actually enter them. It was not such a big deal though, since most of the structures have been cleared out and there is very little left behind in terms of personal relics. 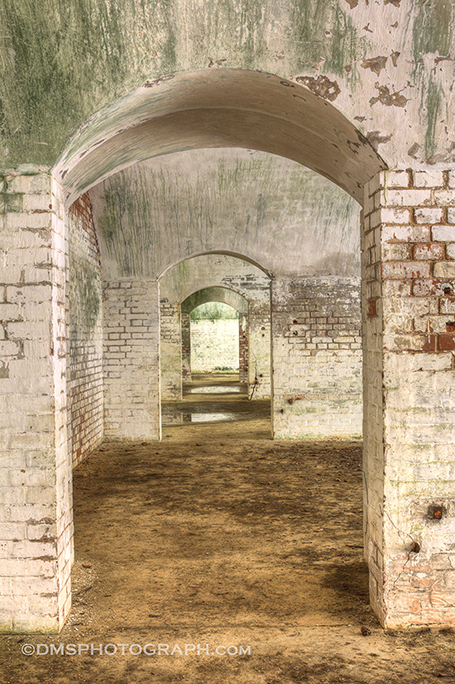 Since the island was a military installation, there were a few bunker compounds scattered about the island. 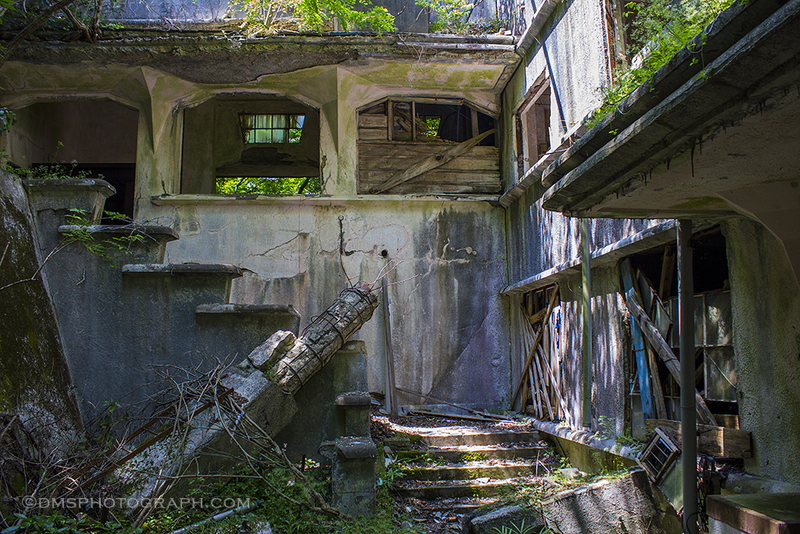 Again, there was not much to be seen but the concrete shells that sheltered the inhabitants of the island. Zooming around the island on the bikes was definitely a treat. For the most part, motorized vehicles are prohibited on the far side of the island. On the high roads you can look out over the Seto Inland Sea and catch a cool sea breeze. On a small road my friend and I spotted a huge snake, possibly the luckiest snake in Japan if it likes rabbits! Looks like all natural predators were not exterminated after all. Soon after spotting the snake, we turned down a small footpath to one of the more interesting haikyo on the island, MAG1. 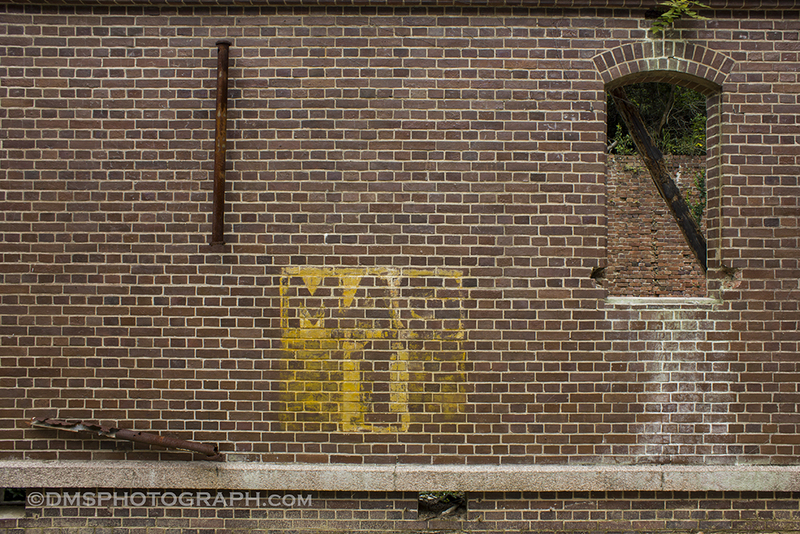 MAG1 was a gunpowder magazine built of red brick. 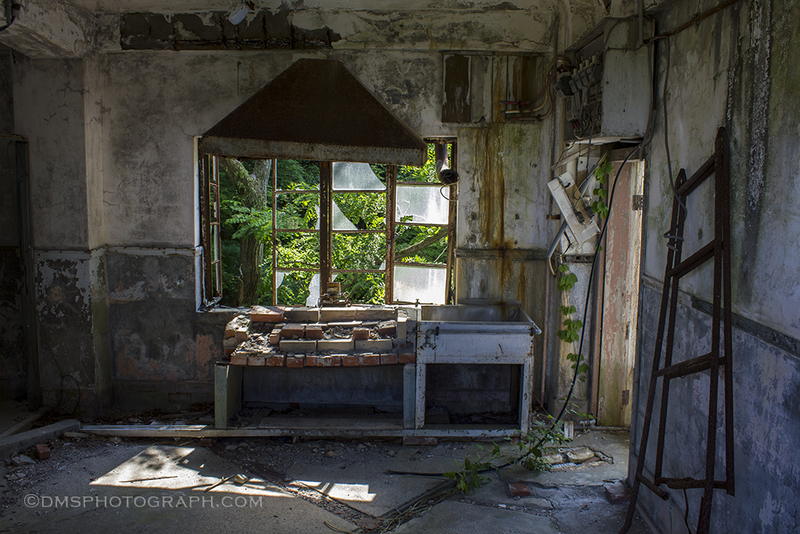 The roof was built out of tile which collapsed to now make the floor covered in overgrowth. 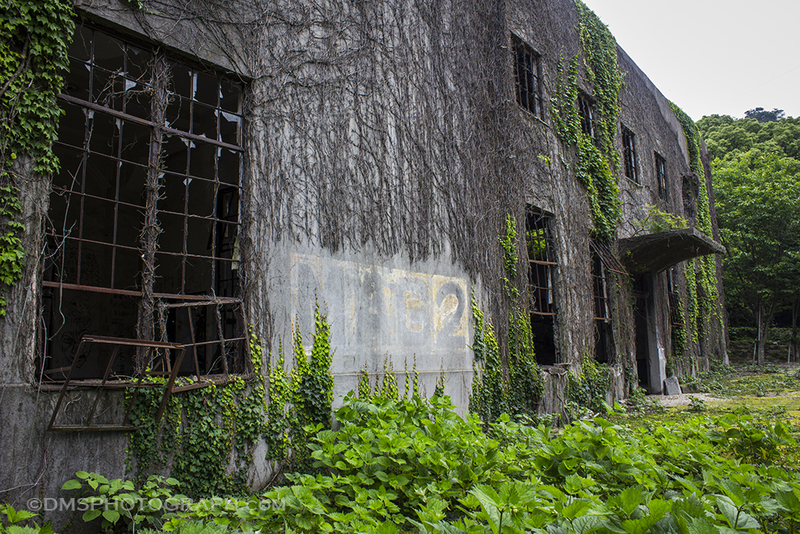 After circling the island we decided to meet up with two of our other friends to check out the most famous haikyo on the island, the power station that supplied electricity to the gas manufacturing plant. Picturesque but not overly exciting with the sun setting, we decided to move on to the last crumbling edifice. 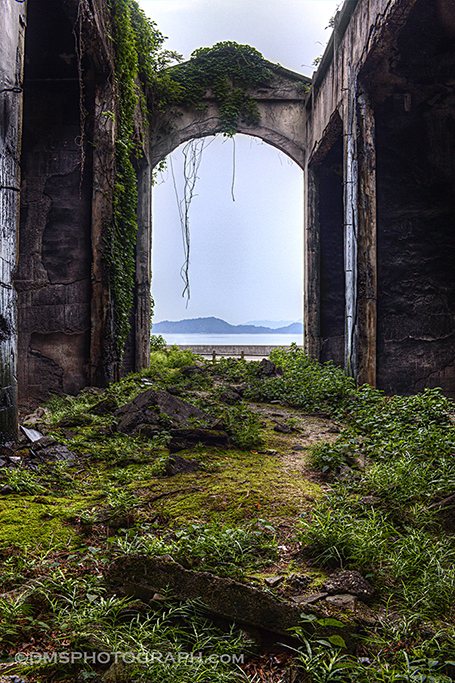 The gas storage facility—a crumbling concrete arch with a stunning view. 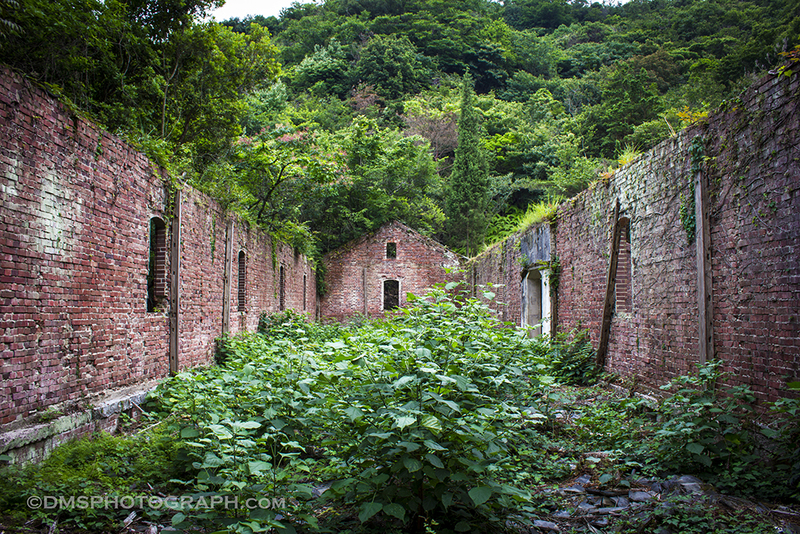 Personally, this was possibly my favorite ruin on the island, because you could look out onto the Seto Inland Sea. 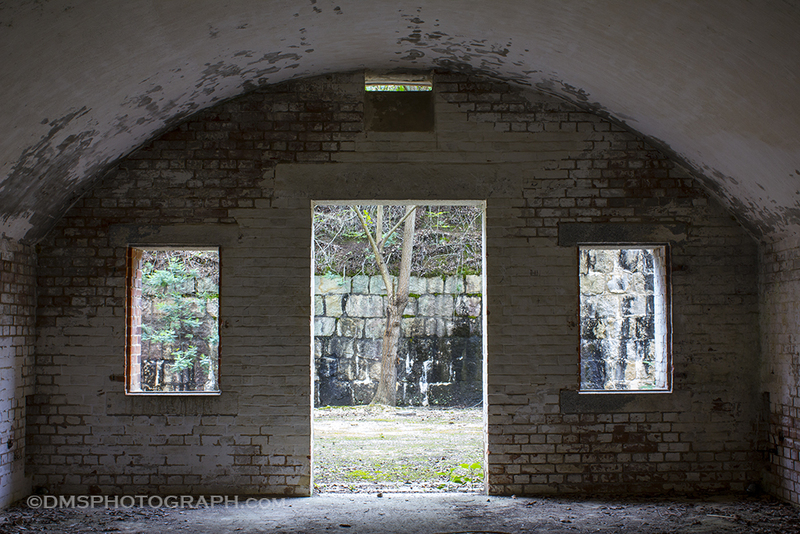 Standing inside the structure was a bit chilling, knowing that it once housed tons of gas and future death sentences. At night we had a wonderful camp dinner after a day of exploration. The next morning was for the rabbits. 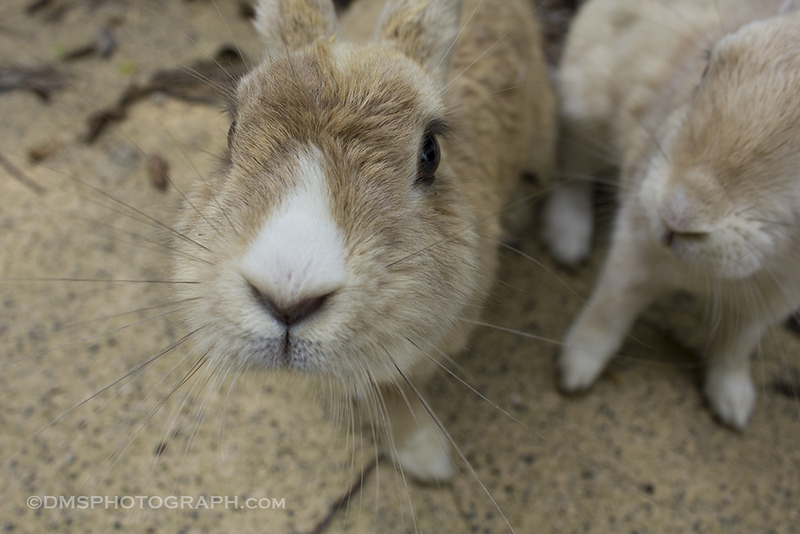 After a few hours with them, I certainly preferred ‘Rabbit Island’ over ‘Okunoshima’. The ruins themselves are not overly impressive unlike their gruesome history. The rabbits on the other hand were overwhelming in both number and kawaii*. *Kawaii – Japanese word for “cute” and overused by every school girl in the country. The morning started much later than we had planned. We had a hearty breakfast of rope and steep inclines. We were about to check into a beautiful hotel surrounded by a lush forest, offering tranquility and mediocre room service. The entrance approached us much faster than expected. We turned the corner around one patch of forest revealing the half camouflaged walls of the majestic Maya Hotel, embraced in the green vines of Mother Nature. Walking through the grand entrance and into the hotel lobby we were very pleased with the décor. 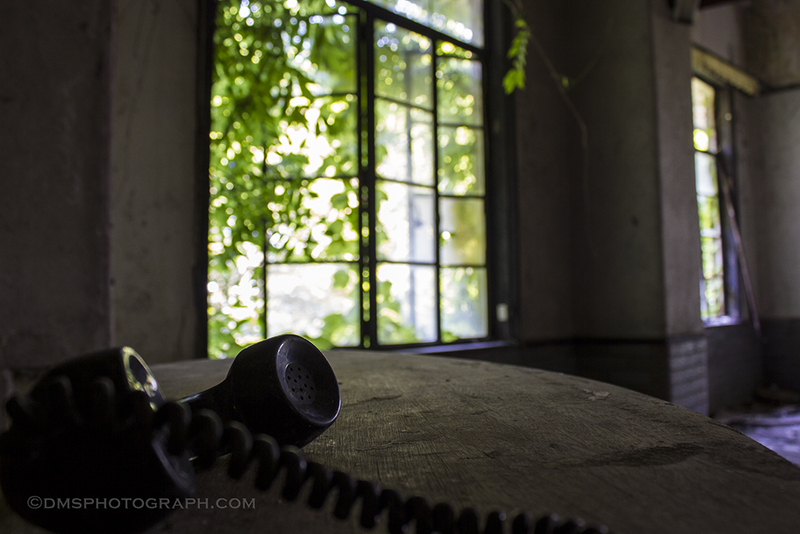 However we heard voices…other guests perhaps? We climbed to the upper level to check out the ballroom. However, the only entertainment was a masterpiece displayed by some unknown artist. It looked like it was a long running exhibition. We continued to hear voices, and my friend pops around the corner and says he just saw something. My heart stops!. 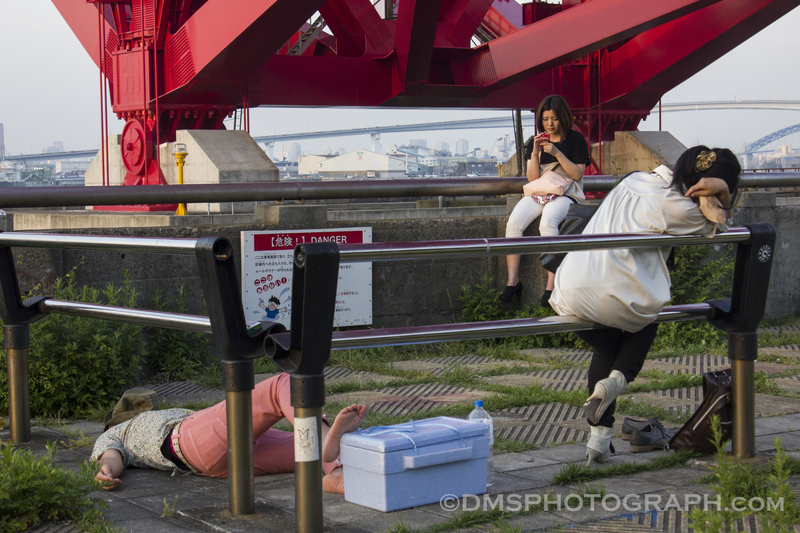 Turns out there were other guests– some cosplay models and a photographer. Phew! They turned out to be really friendly too. 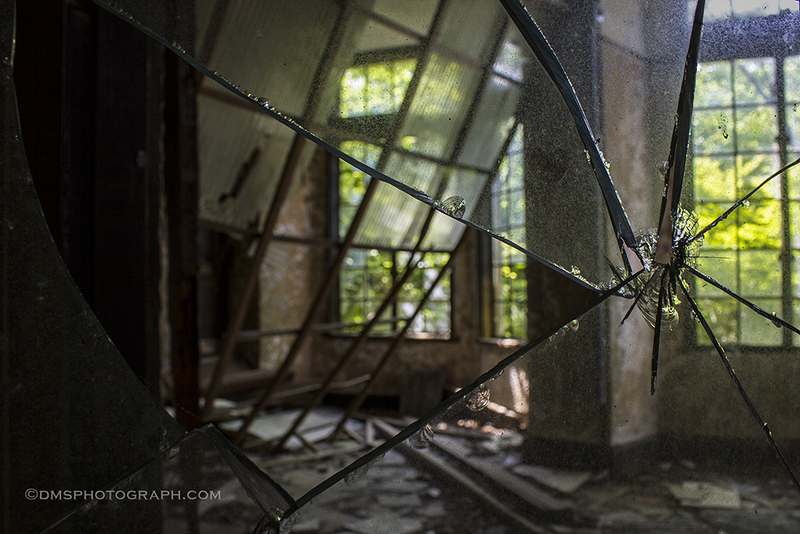 The upper floor was a grand display of broken window panes, crumbling walls and a few scattered relics. 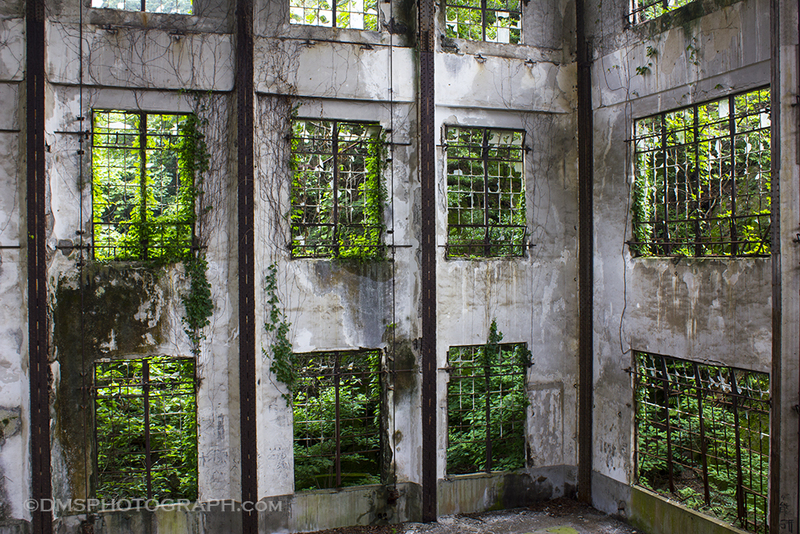 My favorite aspect of the whole hotel was the crumbling grey cement framing the shattered windows that the green forest was determined to invade. This and the artistry the sun painted through the reflections of broken glass. 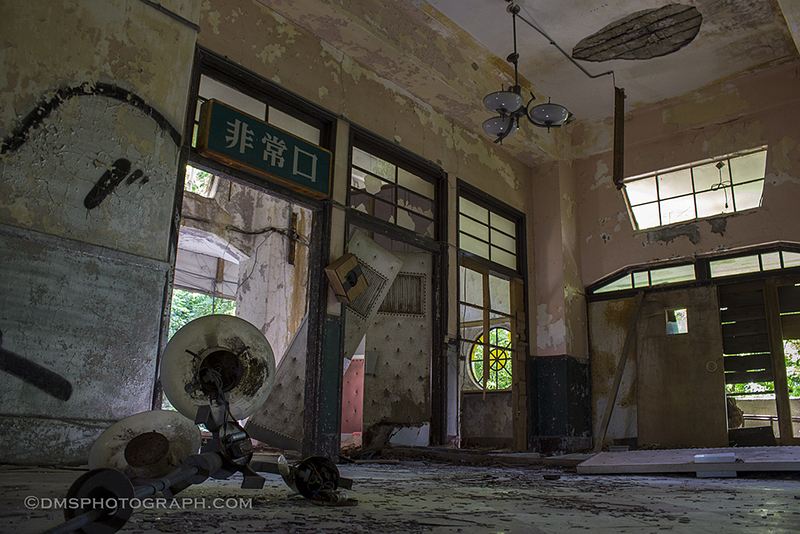 After a bit of exploring I headed back down to the lobby area. I decided to pop in at the reception desk. 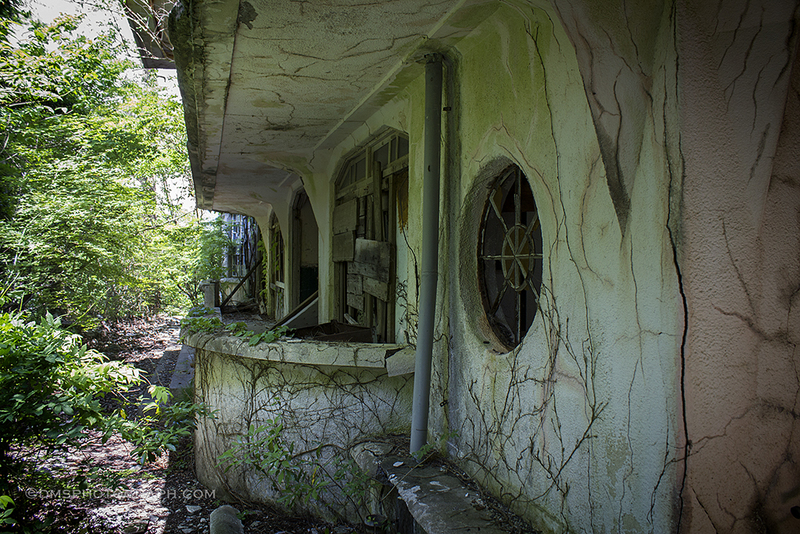 The Maya Hotel ceased serving guests in 1970. But it wasn’t abandoned until 1994, up until then it was used as a student seminar center by a local university. Being forgotten for 18 years has allowed its beauty to fully develop into something that felt like walking into a world created by the famed animator, Hayao Miyazaki. A few more shots of the lobby floor and I decided to check out the guest rooms. The Maya hotel is interesting in that it is built on a mountain side. The lobby floor is really the hotel’s third level. The fourth level has the ballroom and the lower levels have the guest rooms. 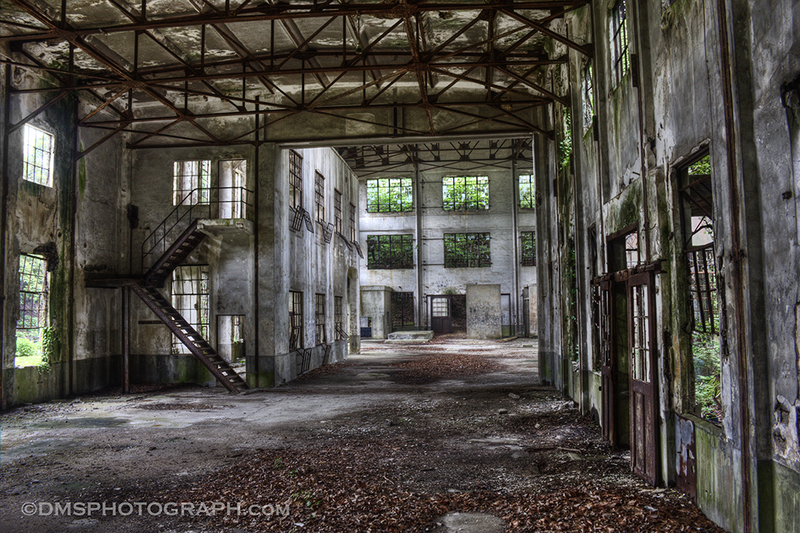 I headed down a dark stairwell and the enchanted beauty of the open upper levels slowly faded into haunted hallways. I wasn’t sure if the carpet on the floor was dissolving or if it was accumulated dirt and dust. 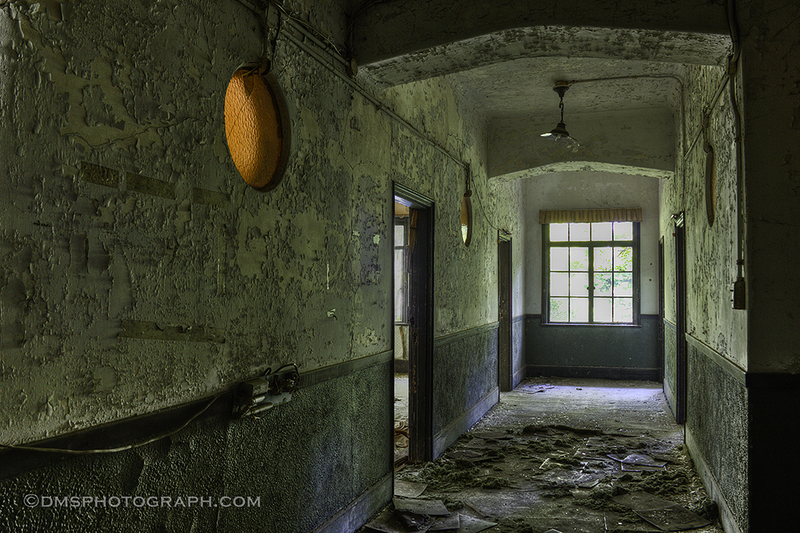 The rooms were empty and the hallways filled with eerie soft glows of sunlight. I continued to the first level of the hotel. 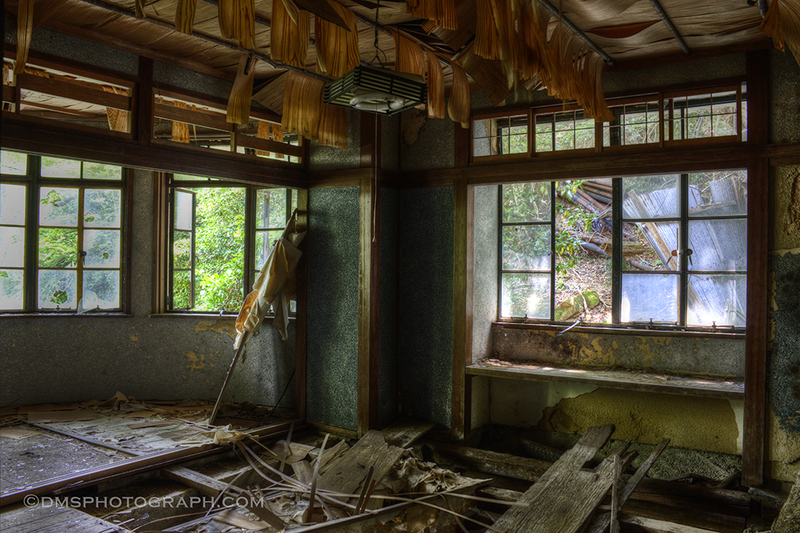 The guest rooms on this floor were Japanese style with tatami floors and traditional fixtures– or rather would have had tatami floors and traditional fixtures. This level was in the poorest condition, closest to the earth so possibly the first to return to it. Besides me almost falling through the floor at one point, my imagination liked to wander towards creepy Japanese horror movie themes with gloomy girls in white dresses and black hair draped over their faces standing at the end of hallways. Leaving the poltergeists in their slumber I headed back up to the lobby level and took a few more pictures. My companions and I grew hungry, and since the hotel’s kitchen was closed we decided it was time to say farewell to the enchanted hotel in the forest. The goal is to create photos that capture more than images. 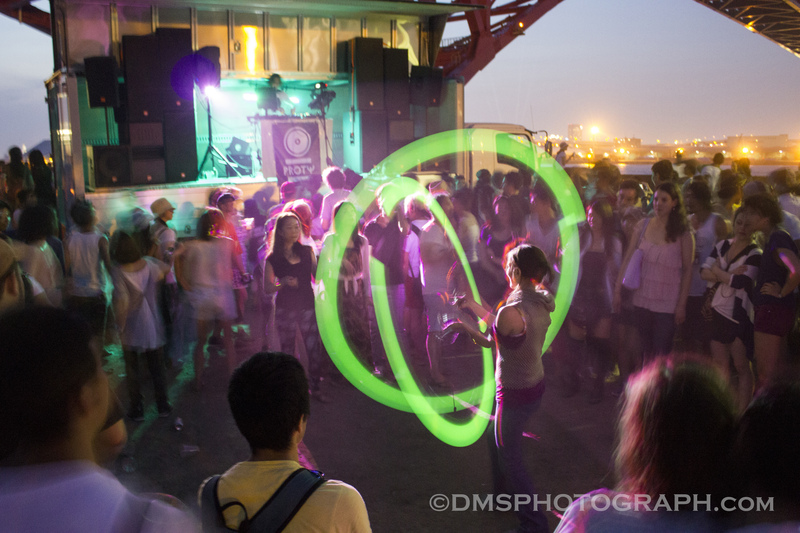 Photos that represent dreams, immortalize memories and share stories. Will you join in on the adventures of an aspiring photographer and story teller? 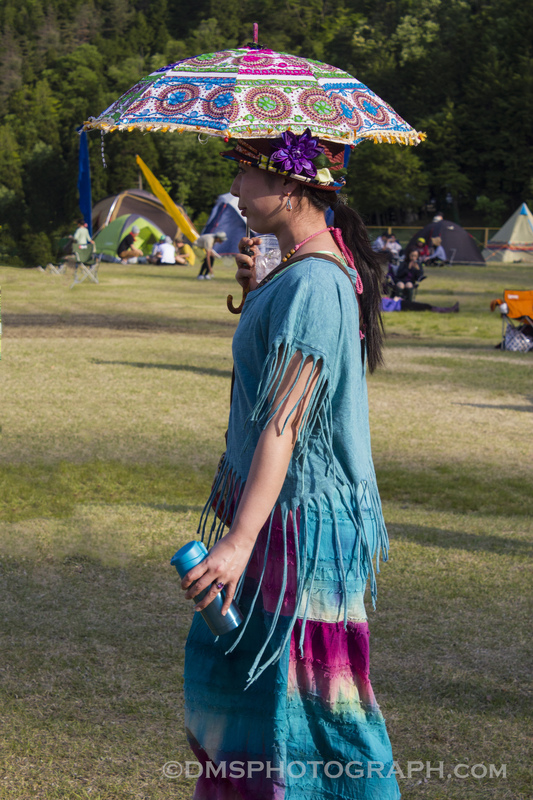 Witness new cultures or the everyday that is overlooked. Follow me on Flickr and check back here for new stories.